Two new Focused Ion Beam (FIB) instruments will accelerate the NanoCenter’s growth and ability to serve industry, principal investigators and research faculty with the latest nanoscale imaging, creation and analysis techniques. Work with the TEM, one of the AIM Lab's most popular instruments, will be enhanced by the FIB because users can prepare the extremely thin samples needed for TEM imaging. Users can more easily create semiconductor chip prototypes, using the FIBs' milling, etch and deposition capabilities. Micro- and nanomachines' operation can be fine-tuned to a meticulous level, correcting and creating tiny working parts. The FIB can precisely cut dissimilar materials that are joined together, allowing novel combinations of materials to be used in nanomachines. 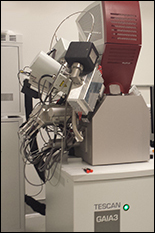 The scanning ion mass spectrometer will extend the FIBs' capabilities to conduct fine-grained sample analysis, providing an extra perspective for complete detail on a sample. The new FIB power is doubled by dual beam imaging (SEM and FIB) for images of the surface and deeper into the material's layers. The two new instruments have complementary abilities: a gallium beam, for extremely detailed FIB work; and a xenon beam for heavy-duty nanoscale slicing and ablation. The Lab's space is being redesigned to house the two new FIBs. This provides a central location for users' ability to access staff expertise and for easy transfer between instruments. Tescan provided excellent results from a set of demanding tests designed to push the capabilities of the instrument. The Ga FIB is currently operating, and the Xe FIB is slated to come online in early summer 2015. A short course on FIB operation and technique will be held in June 2015.